Its been a while since I have blogged with easter and all- so I have built up a bit of a back log of recipes! This one is a great quick meal for just one person or the whole family. Thinking I would make a salad for tea but after having had only half a small one for lunch (not hungry) and a yogurt for breakfast, I ought to have something a little more substantial! Best served with a fresh green salad of rocket, spinach and watercress. Put a touch of butter and a tablespoon of olive oil in a small frying pan over a low heat. Add the garlic and cook for two minutes then add the mushrooms and cook for 4-5 minutes until soft and cooked. Whilst the mushrooms are cooking put a pan of salted water on to boil. Place the gnocchi into the boiling water and cook for two minutes. Over a low heat add to the mushrooms, Creme Fraiche and pesto and stir. 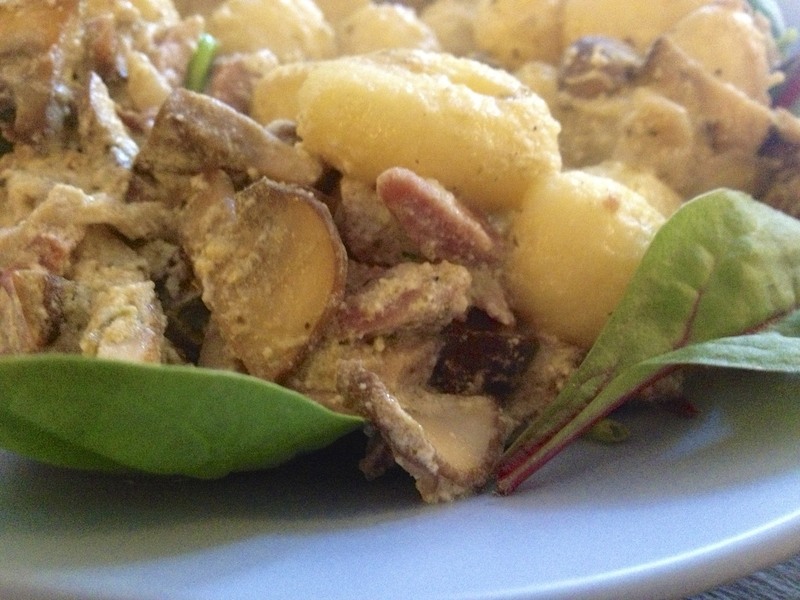 Drain the gnocchi and mix with the mushrooms. Serve on a bed of baby leaf salad.